You sit in front of a computer all day, but do you have any idea who's responsible for pioneering the glowing box that's on every desk in every home and office around the world? I am going to go out on a limb here and assume that you use a computer. You use it to work, you check your email, play games, read the news, catch up with friends, and maybe even use it to learn about a great man or two that you have never heard of. You would think that with a machine that has become such an integral part of our lives, we would have heard more about the fathers of computing. I'm not talking about Bill Gates or Steve Jobs. Today we celebrate the computing contribution of Alan Turing. Alan Turing was one of the most influential people in science or mathematics in the twentieth century. He laid the theoretical groundwork for computing and helped the Allies win World War II by breaking the Enigma code. He also made fundamental contributions to pure mathematics and to the development of programming languages, neural nets, and artificial intelligence. Alan Mathison Turing was born on June 22, 1912 to Julius Mathison Turing and his wife, Sara. At the age of six, his parents enrolled him at the day school St. Michael's. The head mistress recognized his genius even at that early age. In 1927, at the age of fourteen, he was enrolled at Sherborne School, where the teachers were not as receptive to his genius. In spite of this, Turing continued to show that he was adept at mathematics and in 1927 he solved some advanced problems without ever studying elementary calculus. He was encouraged at Sherborne by his close friend and first love interest, Christopher Morcom. Sadly, Morcom died a few weeks into their last term due to complications from bovine tuberculosis. Turing's religious faith was shattered and he became an atheist. His lack of interest in the classics caused him to fail to get a scholarship to Trinity College in Cambridge. Turing instead went to his second choice, King's College, also in Cambridge, where he graduated with a first class honors degree in 1934, and in 1935 he became a fellow at King's due to his dissertation on the central limit theorem. During World War II, Turing was one of the main participants in the efforts to break German ciphers. Turing took the design for the bomba, a Polish, Enigma deciphering machine, and improved it so that it worked faster, and called it the bombe. 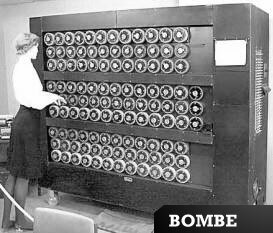 The bombe looked through Enigma protected messages and analyzed them with all of the possible ciphers and rejected the ones with contradictions in them, which were most, leaving only a few to be looked at in detail. By the end of the war there were over 200 bombe machines in use. In 1940, Turing proposed to his co-worker and fellow mathematician, Joan Clarke. After admitting his homosexuality to his fiancée, who was reportedly “unfazed” by this revelation, Turing decided not to go through with the marriage. From 1945 to 1947, he worked at the National Physics Laboratory, where he worked on the design for the Automatic Computing Engine (ACE), this was one of the early stored-program computers and a precursor to modern computers. His ACE design called for an earth shattering 5KB of memory and accessed at the lightning speed of 1 Mhz. He also toyed with the idea of artificial intelligence, and proposed an experiment that is now known as the Turing test. According to the test, a computer can be said to ‘think' if it can trick a person into thinking that they are having a conversation with another person. In 1948 with the help of his former colleague D. G. Champernowne, he developed a chess program for a computer that did not exist yet. In 1952 and lacking a powerful enough computer to execute the program, Turing played the game in which he simulated the computer. Each move took about 30 minutes. The game was recorded and the program lost to Alick Glennie, Turing's colleague. The program allegedly won against Champernowne's wife. This program eventually gave rise to the chess programs of today as well as artificial intelligence. In 1952, he was convicted of gross indecency for homosexual acts. Turing was given the choice of imprisonment or to undergo hormonal treatment designed to reduce libido. He accepted chemical castration via injections of oestrogen hormones. One of the unfortunate side effects was that he grew breasts. June 8, 1954, Turing's house cleaner found him dead with a half eaten apple beside his bed. Autopsy concluded that the cause of death was cyanide poisoning. So the next time you are at the pub, in the cafeteria, or even by yourself, call for some quiet, and raise a glass of your preferred beverage to Alan Turing, one of the fathers of computing. Not to diminish Turings contribution to computer science and many other fields or the noble ways he fought his ultimate persecution at the hand of the country he helped save, but he didn’t invent the computer program. He certainly contributed large pieces of what we consider it today, but cursory research (pardon the pun) would show earlier efforts that are essentially computer programs. See Babbage and Lovelace for their mechanical programmable computer in the 19th century to start. Thanks for highlighting Turing, though. He shaped the world we live in. I’ve known about Turing for 30+ years. Obviously you are speaking to some other “you” that didn’t study either math, philosophy, computer science, or the history of WWII. .-= Andrew´s last blog ..Know It All: What’s the Longest Word in the English Language? =-. Many thanks, Mr. Andy Luscombe, but Turing’s birthday should be June 23rd, not 22nd.